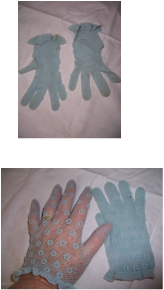 These gloves are a genuine vintage item and would be circa 1950/60. They actually look like they would be a match for our little blue clutch sequin evening bag which we are selling as well. They look very small when they are not on, They are made of stretchy material and we have put them on our hands and they fit quite well. The top of the gloves have a little frill which goes around the wrist. They look very pretty and retro. This is a very pretty little clutch evening bag which would be circa 1940/50. It has metal zipper at the top which works perfectly. It opens up to a cream satin type lining which shoes an aged mark on it. This does not go through to the front material. The sides of the bag has sequins and sewn on simulated pearls to form a heart design. There is wear to both sides of the little purse and some sequins and pearls are missing. See our pictures. It is a lovely bag which would add to a costume of that era, or to even use today with care. It is 16cm long and 10cm wide. This is a lovely vintage handbag. It has a metal clasp at the top which works perfectly. It opens up to a light blue satin type lining which shows brown aged marks at the top. This would just from normal use of the bag. The inside lining has a small pocket for your hanky or credit cards. It is unusual in the fact that it folds over to form a smaller bag. One side has a pattern of blue beading which forms flowers and the sequins are at the back of it. The other side is pale blue satin with a few sequins on it. The bottom of the bag has about 8 rows of sequins so that when folded over it looks consistent with the other side. This bag is very chic. There does not appear to be any loss of beads or sequins to it. It is a lovely bag which would add to a costume of that era, or to even use today that special occassion. It is 21cm long, 12cm when folded, and 12cm wide.